12.5" RCOS @ ~f/9 (2880 mm fl) 0.64 arcsec / pixel. The Zoomify image scale is 0.85 to 3.24 arcsec / pixel. eXcalibrator for (b-v), (v-r) color balancing, using 10 stars from the NOMAD1 database. PixInsight for on-linear stretching and gradient removal. NGC 925 is a strongly barred somewhat distorted galaxy in the constellation Triangulum. 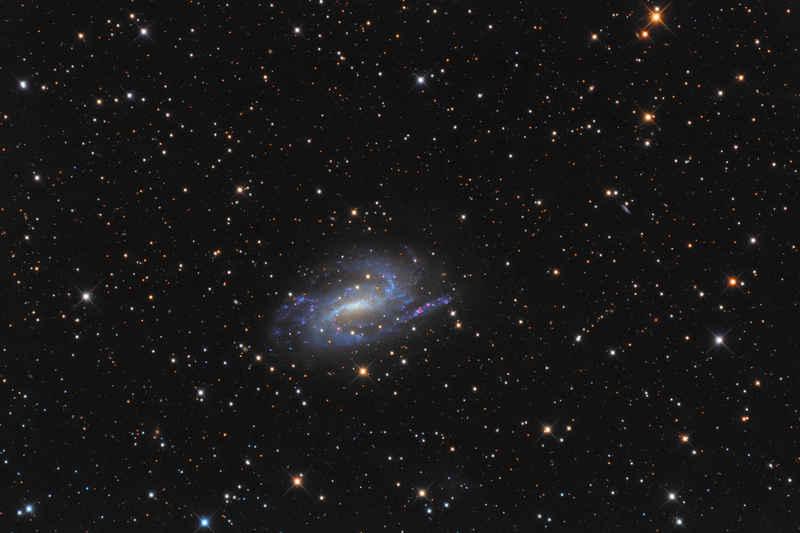 The NED database places the galaxy at a distance of about 14.5 million light-years. NGC 925 has at least 132 cataloged HII regions. Many of these bright red-pink areas are visible in the above image.